What do you think of the INF Treaty on its anniversary? 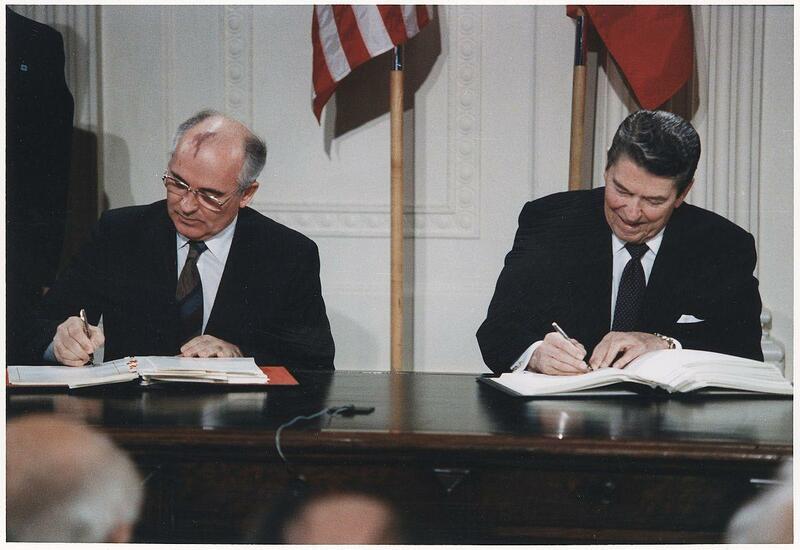 On December 8, 1987, President Ronald Reagan and Soviet Secretary General Mikhail Gorbachev signed the Intermediate-Range Nuclear Forces Treaty (INF Treaty) and eliminated all short- and intermediate-range nuclear and conventional missiles. As of 2018, the INF Treaty faces an uncertain future amid mutual accusations of violations between the U.S. and Russia and the missile development activities of non-signatory nations like China and Iran. Why did it come up? In 1977, the Soviet Union deployed a mobile, concealable intermediate-range ballistic missile capable of carrying three nuclear warheads known as the SS-20 Saber in its European territories. While the missile’s range was limited enough that it didn’t qualify as an intercontinental ballistic missile (ICBM) under the SALT II arms control agreement, it posed a significant threat to Europe. On the first track, 1,000 nuclear warheads would be removed from Europe while the U.S. negotiated with the Soviet Union on limiting intermediate-range nuclear warheads. If the negotiations failed, NATO would take the second track and modernize its own arsenal of intermediate-range nuclear warheads and deploy them beginning in 1983 to West Germany, Belgium, Italy, the Netherlands, and the United Kingdom. Before formal negotiations began in 1981 President Reagan proposed the Zero Option to then-Soviet leader Leonid Brezhnev, which would’ve eliminated intermediate nuclear weapons on both sides of the Cold War divide. Reagan also proposed a broader, overarching nuclear arms reduction treaty known as START in 1982, and in 1983 advocated for the Strategic Defense Initiative (SDI) ― the missile defense system referred to as “Star Wars”. Over several rounds of talks in 1982 and 1983, the Zero Option broadened to include equal rights and limits on U.S. and Soviet missiles. But a deal wasn’t reached, and American Pershing intermediate-range missiles were deployed to West Germany in November 1983 ― prompting Soviet negotiators to walk out. Negotiations resumed in 1985 after British Prime Minister Margaret Thatcher helped broker talks between the U.S. and new Soviet leader Mikhail Gorbachev. At the 1986 Reykjavik Summit, Reagan and Gorbachev nearly reached an unexpected breakthrough agreement to eliminate all nuclear weapons, but Reagan refused to confine SDI to laboratory research and that deal went by the wayside, although negotiations on INF Treaty continued. In 1987 negotiations progressed to the extent that in August, West German Chancellor Helmut Kohl removed the Pershing missiles after previously opposing such a move out of fear it’d expose West Germany to an attack by the Soviet-backed Warsaw Pact. The INF Treaty set a deadline of June 1, 1991 for the U.S. and Soviet Union to eliminate all of their ground-launched nuclear and conventional missiles (plus their launchers) with ranges between 310 and 3,420 miles. After that date, each side was to conduct on-site verification inspections of the other’s INF facilities for a 10-year period, while the ban on weapons carried on indefinitely. “The numbers alone demonstrate the value of this agreement. On the Soviet side, over 1,500 deployed warheads will be removed, and all ground-launched intermediate-range missiles, including the SS-20's, will be destroyed. On our side, our entire complement of Pershing II and ground-launched cruise missiles, with some 400 deployed warheads, will all be destroyed. Additional backup missiles on both sides will also be destroyed. The treaty was ratified in May 1998 with a 93-5 vote in the Senate and took effect on June 1, 1988. What has its impact been? By the end of May 1991, 2,692 intermediate-range missiles were eliminated ― including 846 by the U.S. and 1,846 by the Soviet Union ― and each side carried out inspections of the other’s former missile facilities. Following the dissolution of the Soviet Union on December 25, 1991, the once-bilateral INF Treaty was broadened into a multilateral treaty that included participating Soviet successor states Belarus, Kazakstan, Russia, and Ukraine. Another two successor states, Turkmenistan and Uzbekistan, each have only one INF site in their territory so they play a less active role in enforcing the treaty. Russia began to express regret about the INF Treaty during the administration of George W. Bush and suggested it be abandoned, citing the fact that its non-signatory neighbor China and other non-signatory rivals like India, Iran, and Pakistan are developing intermediate-range ballistic missile capabilities. In 2008, Russia started testing the SSC-8 Novator ground-launched cruise missile, which is nuclear-capable and has an estimated range of 1,500 miles ― which would place it within the jurisdiction of the INF Treaty. As testing from fixed and mobile launchers progressed, the Obama administration informed NATO in 2014 that Russia had violated the treaty by developing the missile. Russia claims the SSC-8 missile is compliant with the INF Treaty and rejected a 2016 U.S. request for a special verification commission to deal with the alleged violation. Russia has also alleged that U.S. missile defense installations in Poland and Romania violate the INF Treaty because they have ground launchers that could support intermediate-range, nuclear capable Tomahawk cruise missiles (the missile as currently designed and produced can only be launched from air or sea). On December 4, 2018, Secretary of State Mike Pompeo announced that the U.S. would suspend its participation in the INF Treaty in 60 days over Russia’s alleged violation “unless Russia returns to full and verifiable compliance”. Pompeo added that no testing, production, or deployment would occur until after the 60-day window closed. But the following day, Russian President Vladimir Putin responded that if the U.S. abandoned the iNF Treaty and developed new intermediate-range nuclear missiles Russia would do the same.